Ryan Petrich rarely releases Cydia tweaks, but when he does they are worth noting! Today he has released a tweak in his beta repository that will cater towards those who use voice memos on a consistent basis. The tweak is called Voice Memos Toggle for Activator and will simply allow you to set an Activator action for automatically launching the Voice Memos app and starting the recording process. When you install the Voice Memos Toggle for Activator Cydia tweak you will simply need to go into the Settings app, followed by the Activator tab and then assign an Activator action to the new Voice Memos trigger you will find in the Audio section. I chose to do a single tap in the left side of the status bar, which I found to work pretty well. With the Activator Action assigned, commence the action and you indeed see it start working as advertised. 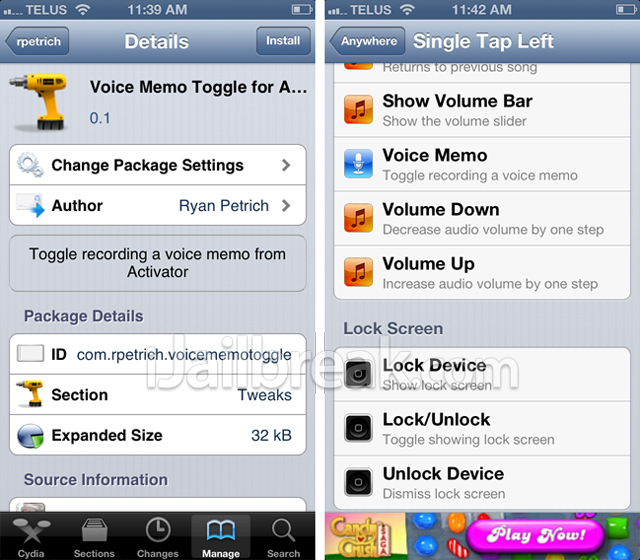 As mentioned previously Voice Memos Toggle for Activator is not available in a community repository, what you will need to do is add Ryan Petrich’s repository yourself by launching Cydia, going into the manage tab, tapping the edit button, followed by the add button and then type the following URL into the input field. Let us know what you think of this tweak in the comments section below and don’t forget to check out our video review.